The Audinst HUD-DX1 is a solid state headphone DAC and amplifier combo from Audinst, Korea. 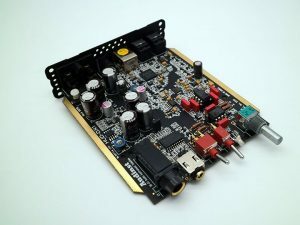 Audinst is a company established in 2009 with the goal of bringing PC-based audio components to the Hi-Fi grade level and it seems to be on track towards achieving this goal. The HUD-DX1 is the company’s 4th and latest DAC offering. Its predecessors, the HUD-mx1 and HUD-mx2, have received numerous awards in Japan and Poland. Packed in a 104mm x 120mm x 34mm industrial metal enclosure, the unit features two pairings in its circuit design, catering for its two key functions of D/A conversion and amplification. Audinst paired ESS’s Sabre ES9018K2M with XMOS’s high speed USB 2.0 audio controller, to achieve support for Native DSD (DSD64 / DSD128) and DXD (24bit 352.8 kHz to 32bit 384 kHz) playback, while pairing of NJRC’s MUSES8920 and TI’s TPA6120A2 allowed output power rated 1,500mW@ 32Ohm when running on DC power and 500mW@32Ohm when running on USB power with an Output impedance rated at 2Ohm. The circuit design also features noise regulation and protective circuits making it a technically competent build. The front panel of the HUD-DX1 has two earphone outputs, one 6.3mm TRS and one 3.5mm TRS, a thoughtful design which eliminates the need to look for an adaptor when using a single-ended connection and if required also caters for the connection of two pairs of earphones. It also has two switches, one for output selection (earphone, speaker) and the other for input selection (optical, off or USB) as well as a volume knob and a tri-colour LED (“on”, “signal” and “error” status). The rear panel features the remaining interface connectors namely a USB 2.0 type-B and optical for input, a pair of RCA and optical for output as well as the connector for the external power supply, like its predecessors the HUD-DX1 can be powered by USB, the availability of external power caters for scenarios where you need to power earphones of high impedance or where audible noises can be heard when powered by USB. As a DAC, the HUD-DX1 is excellent and was able to playback the entire array of formats thrown at it, including DSD, without error. In fact, with the optical output, the HUD-DX1 can function as a dedicated DAC in any set up. The sound quality of the DAC output is good, a dynamic presentation with comfortable sound staging exhibiting significant depth and weighty Mids which is supported by well-rounded bass without any noticeable roll-offs in the lower range. The HUD-DX1 shines on treble, in particular the treble voice but lacks the quality to fill up the airspace which would otherwise be a spectacular highlight of the HUD-DX1. As a headphone amplifier, the HUD-DX1 performed well. It is musical, engaging, lively and detailed, reproducing the range and details similar to what I would have heard from the source. A truly neutral amplifier which is competent in powering all the earphones during the audition, with the exception one, the HIFIMAN Susvara, where I had to open up the unit and set the jumper to high-gain, after which the Susvara sang without much difficulty. This review unit is provided by E1 Personal Audio Singapore.